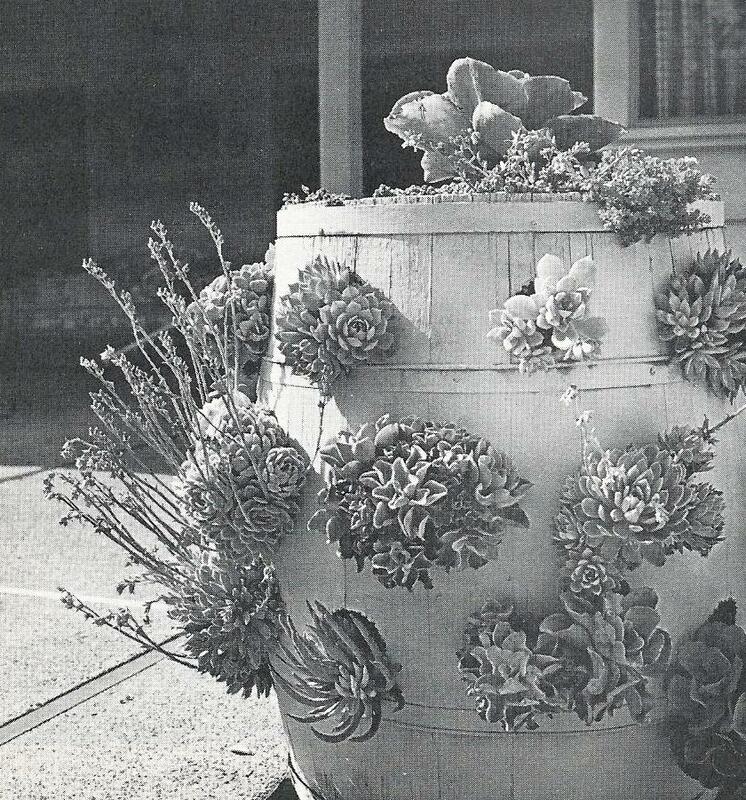 lucy violet vintage: Succulent Succulents. We love our succulents around here. Panda Plant (Kalanchoe tomentosa) in West German pot. I like to think of them as living sculptures. Plants that look like works of art. I pinched that line from my 1965 copy of Better Homes, House Plants, but I couldn't put it any better myself, so it's staying! 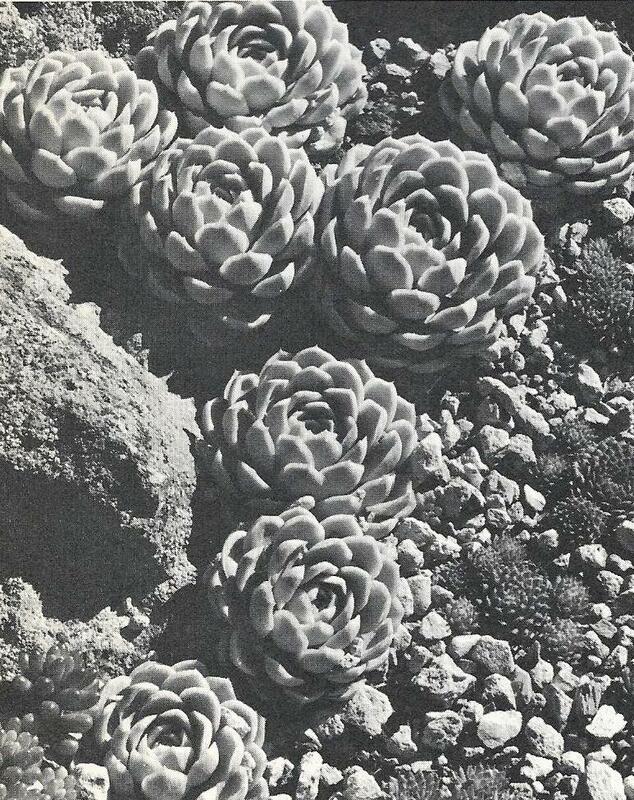 Succulents are just as fashionable now as they were forty years ago when my Mum planted them in her rockery. all images from Succulents and Cactus. A Sunset Book, published in 1974.
images Better Homes, House Plants, published in 1965. All the cool kids have them! 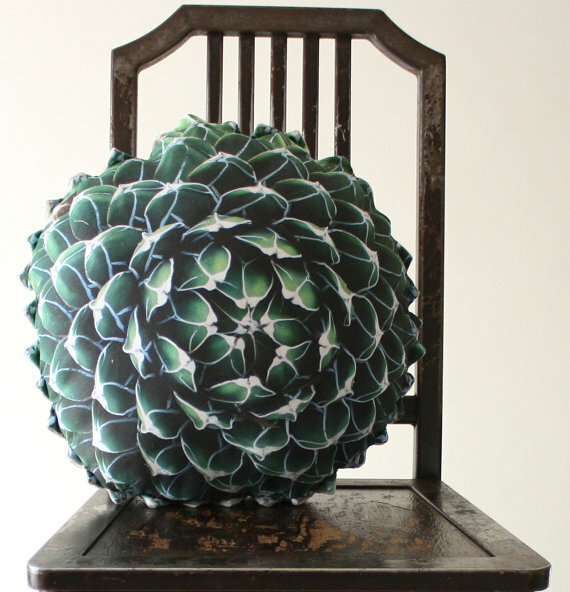 what about a succulent you can sit on??? If you had one of these, you'd be really, really cool! Handmade by Sabine Herrmann, and for sale in her shop Plantillo. I just want to touch them, don't you? p.p.s. thanks for all your ego boosting comments on me and my skirt...thank God it's a skirt and not a top...my head's so big now, I wouldn't be able to get it on!!! Edit: read this funny article on "how to steal and propagate succulents". It's a good one. While you're at it, why don't you pop over to Patsy's she writes a good blog, I think you'd like it. I do. 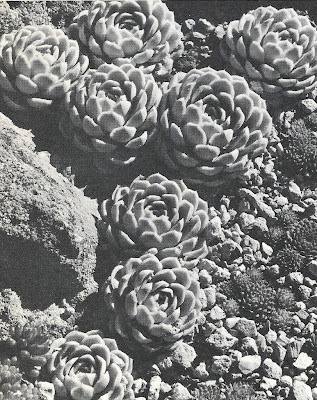 I have a soft spot for succulents as they have featured heavily in family gardens as I grew up. Those cushions are amazing...I am off to investigate further. Thank you! loving the coffee table with gravel insert and the barrel-o-succulents! Tres chic! Your Panda Plant looks great hanging out in it's West German pot!! A friend who was recently married actually had a succulent bouquet for her wedding!! I love succulents too! I think they have an edgy look that makes them perfect for use with mid-century decor. Honestly who oesnt like some succulents. I always love visiting my Nan it's alway free rein to take cuttings. I really do need to get onto planting them through my huge retaining wall. I have a few house leeks and cacti, they've even survived the snow. Those cushions are so realistic. Those pillows are quite great! Dear Stylish, yes succulents are very cool. And easy to please. I might put mine in the rain now. 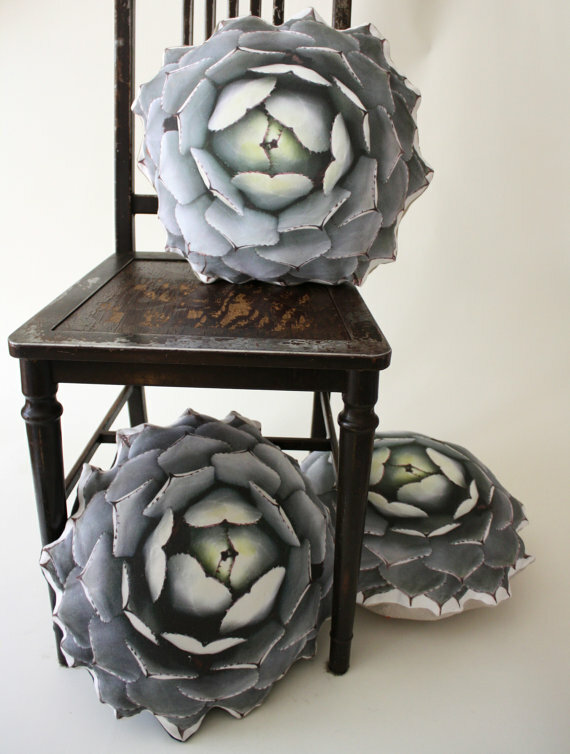 A succulent cushion is bordering on surreal. I like the way you tick. Those are really very cool cushions. I agree about succulents, although I don't have any at the moment. We had a vicious (and now late and lamented) aloe vera called Spiky Mike - it grew huge and the kids were scared of it! For some reason I thought you had more followers than you do. I had to award blogs with 300 or less followers so skipped past you as was SURE you had hundreds. But you know I love your blog. I love succulents too. I love that word. Succulent. Say it. SUCCULENT. Marvellous. Those cushions look amazingly realistic. like you might look twice before planting your bum on the seat. Found this in my succulent research, thought you might get a giggle from it. Love succulents...you can't kill them which works for me! Gorgeous. 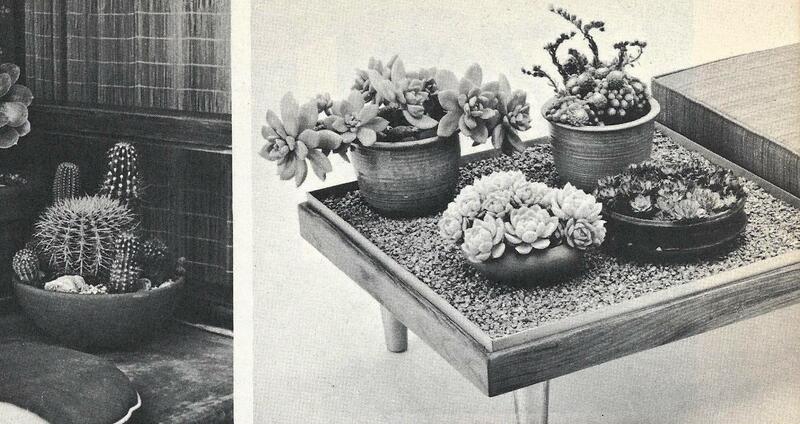 Wow, that planter and succulent in your first image both look amazing! Imagine finding great plants like that at the side of the road! 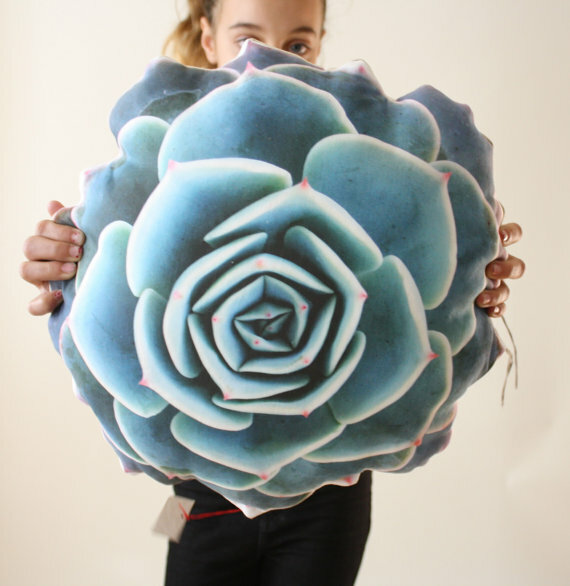 I absolutely looove succulents too, they're so beautiful!! All the great shades of green and their wonderful sculptural shapes. 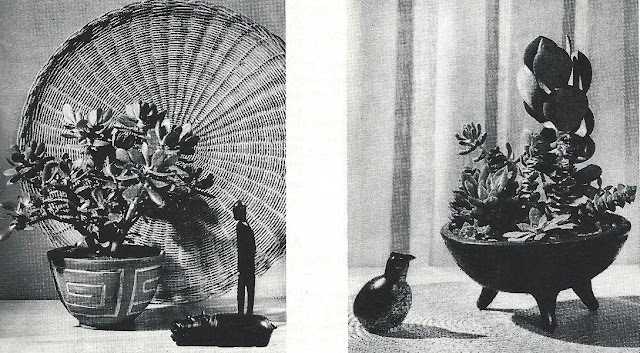 Love those 60s photographs, the plants and pots are amazing! My G is really into cacti and succulents! He'd loooove these pix. I loooove that West German pot!! And the succulents, of course. My fave thing about them is that they're easy care! Great for a black thumb like me! Thanks for the plug Kylie! I've found some great blogs from your list, what a lovely little community we have going. Glad you liked the article, it did make me chuckle too, especially as I have done that sneaky cutting thing more than once myself. I'm a succulent fan too - great for a lazy gardener! Love them. I want that planter with the 3 legs from Better Homes. Any other info about it supplied. Super cool. Those agaves in your garden look amazing. I would never think to plant anything like that but this is really inspiring. The old pictures are great too. Particularly love that one of the barrel. It just goes to show, wherever you are Mother Nature presents you with something to make into a garden of beauty. I like succulents a lot and use them extensively in our garden. I replace all dead plants with succulents. I want a succulent cushion! of course having a climate for succulents does help.